As I have mentioned before, I don’t like to make separate dishes for kids; whatever we serve the adults we also serve the kids. They don’t always love it, but we make them try it, and it’s all they get. The hope is that they will learn to enjoy a wide variety of foods )and learn to react politely when they’re served something they don’t enjoy). I am frequently surprised at the things they like and the things they don’t. (My oldest daughter won’t touch mashed potatoes which I really struggle to understand.) Tonight, my six-year-old son ate what was on his plate and then ate the rest of the fennel. All of it. By itself. Not what I would have predicted, but I’m now looking forward to making this again soon. Prep – using a mandoline, slice the fennel bulbs into 1/8” thick slices. Transfer to a bowl. Using a microplane grater, zest the orange into the fennel. Cut the orange in half and squeeze the juice into the bowl with the fennel and orange zest. Add about 2 Tb extra virgin olive oil. Roughly chop some of the fennel fronds and add to the sliced fennel bulb. Toss and set aside. About 45 minutes before you want to eat – set the salmon on the counter and allow to come to room temperature. About 30 minutes before you want to eat – preheat the oven to 475. In a large pan, heat some extra virgin olive oil over medium-high heat. When the oil is hot, add the onion, carrot, and celery. Season with salt and pepper and cook until barely soft – about 8 minutes – stirring occasionally. Add the garlic and cook another minute or two. About 20 minutes before you want to eat – in a separate skillet or baking dish, add some olive oil and several sprigs of fresh thyme. Place into the oven for about 5 minutes. Add the tomatoes to the beans and stir to combine. Cook a minute or two, then add the beans and chicken stock. About 15 minutes before you want to eat – season the salmon with salt and pepper. Remove the skillet from the oven and carefully place the salmon skin side up in the pan. Return the pan to the oven for 5 minutes. About 10 minutes before you want to eat – Remove the pan from the oven. Carefully remove the skin from the salmon, season with salt and pepper, and flip. Place the pan back in the oven until salmon is done – 3 – 7 minutes. Continue stirring the beans occasionally. When salmon is done, remove from the oven and remove the salmon from the pan. Sprinkle with fresh thyme leaves. Place a serving of beans on a plate or in a wide, shallow bowl. 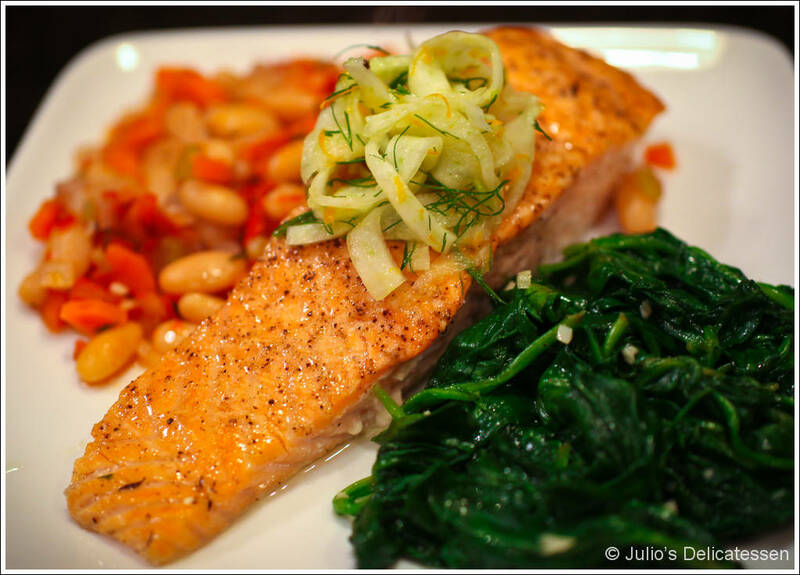 Top with a piece of salmon and place a spoonful of the fennel salad on top of the salmon.